The Asian longhorned tick is native to East Asia and has also been well described in New Zealand and Australia. In the tick’s native range, it has been known to cause Theileriosis disease in cattle, as well as a frequently fatal viral disease called “Severe Fever with Thrombocytopenia Syndrome” (or SFTS) in humans; the SFTS virus resembles Heartland virus, a pathogen that may be found in Virginia’s environment. There is also some research from this tick’s native territory in Asia showing that the Asian longhorned tick might be capable of transmitting Lyme disease (from an Asian Borrelia species), as well as Human Anaplamsosis and Ehrlichiosis pathogens, and a Spotted fever Rickettsiosis. However, more time will be needed to assess the tick’s ability to acquire and transmit these various pathogenic agents found in the United States. An interesting feature of this tick and a major factor enabling its rapid spread, is the ability to reproduce asexually, a process known as parthenogenic reproduction. To date, no males of this species have been confirmed among the many thousands of females that have been discovered. 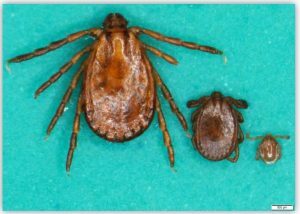 This tick also boasts a broad host range and has been found on birds, rodents, terrestrial mammals, livestock, domestic pets, and even humans. Also, this species of tick has been found in both field and forested environments in Virginia and may be common in pasturelands where livestock might be found grazing. This is atypical of Virginia’s most common human-biting tick species, as they are more likely to be found in a forested environment. Use EPA registered repellents, such as permethrin, to treat your shoes, socks, pants, and shirts, and ALWAYS follow the product label for use. Ticks typically start to climb onto people from the ground, or from low vegetation, so the use of repellents and protective clothing should also be from the ground, up. Tuck your pant legs into your socks and shirt into your pants when in forest or pasture environments. Avoid any unnecessary walks in brushy or wooded environments, or grassy fields, especially when not using repellents.